Having had such success with our guidebook when looking for somewhere to eat out, we decided to give it another spin for the next day's activities. La Pelosa was listed as one of the most spectacular beaches on the island so we headed over to it. Unfortunately, everyone else must have thought so too... when we got there you couldn't see the beach for people. The waters were a stunning colour but the area lacked the tranquility we were craving so after snapping a couple of photos we turned around and headed back to Alghero. On the hunt for another activity, I remembered reading about Neptune's Cave and we managed to book ourselves onto the last trip of the day. 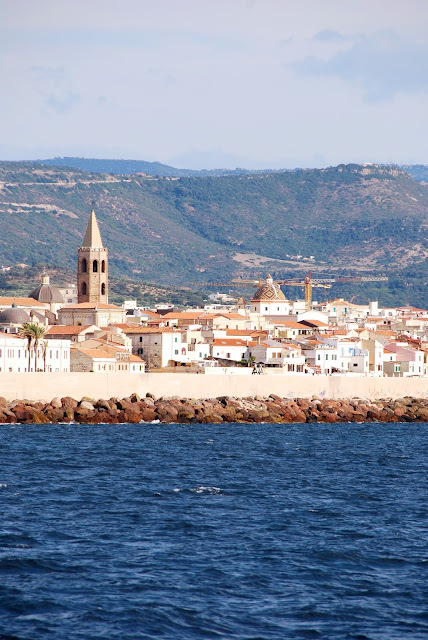 Alghero may not be the largest place to visit in Sardinia but it's certainly one of the prettiest. The old-town is by far the most picturesque part - and can be reached via little archways leading off the harbour. Be warned though - the streets are made up of pebble-stone cobbles and therefore not somewhere you should venture in heels. On our first night we headed for dinner at Il Pavone - a restaurant the guide book recommended. We got there a little early, which was a blessing as we managed to catch the sun setting over the sea in the harbour - a little bit of pink-tinged magic. After our brief stop to explore Castelsardo, we continued on to our next destination. For the second part of our trip we stayed at the Corte Rosada resort near Alghero. The hotel had a private beach and it was a haven for local wildlife. I spent most of my days here making more fishy friends and pretending to be Dr Dolittle. Porto Conte itself isn't more than a few houses grouped along the shore. It has a private harbour - but we got around that by hiring a pedalo so we could go and admire the boats. 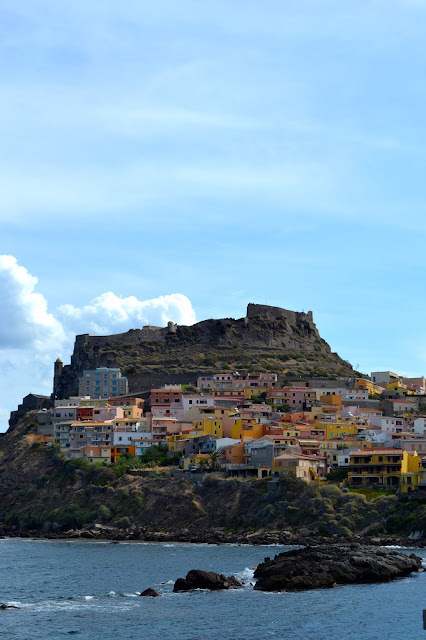 When we left Isola Rossa, we headed south along the West Coast and on the way we decided to stop off at Castelsardo. The castle itself is 12th Century but the area's history extends back much further than that. There is some parking higher up but we opted to walk up the hill so that we could see more of the town and it's charming shops (note to self - next time, do shopping on the way down). It was quite a climb but we were rewarded when we got to the Castle with a blast of fresh air at the top and the most stunning views of the harbour and the Sardinian countryside behind. Oh and there was a Gelato shop up there - so that helped too! Giraffe print top (no longer available): H&M Conscious collection. For the first part of our trip to Sardinia we stayed in the beautiful Hotel Relax Torreruja. Located on a rocky outcrop in the north of the Island it's surrounded by stunning views - but be warned it can get a little breezy up there! It's a moment away from the small-but-perfectly-formed town of Isola Rossa. There isn't a huge amount to do, but quite honestly that didn't seem to matter as the days slipped by easily. I spent them laying out in the sun overlooking the sea, reading a few good books and slipping into the sea to make friends with the fishes whenever I needed to cool off. I packed a lot of summer dresses for the trip and the Topshop one below is an oldie but a goodie. It's very girly and flirty - perfect for sunny summer evenings. As it's one from way-back-when it's no longer available in stores but there are similar options here and here.